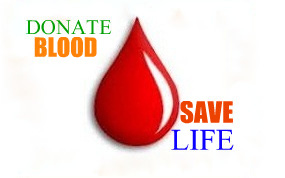 " WHY DONATE BLOOD... "
Donation of blood has a specify reason, to save human life. You just need your own reason. As,some of us give blood because we were asked by a friend or relative. Some because they feel they might need some day. Some because they believe it is the right thing we do. The need for blood is constantly required, so what ever the reasons may be You'll feel good that you have helped save a life. You don't need a special reason to give blood. You just need your own reason.Some of us give blood because we were asked by a friend.Some know that a family member or a friend might need blood some day.Some believe it is the right thing we do.Whatever your reason, the need is constant and your contribution is important for a healthy and reliable blood supply. And you'll feel good knowing you've helped change a life.